About: Thom Thom is a French street artist born in 1973. Working on billboards, Thom Thom started collaborating with Jacques Villegle, the famous Parisian “poster-décollagiste”. The simplest urban material – street posters – became an excuse to create art for these two artists. Based in Paris since the year 2000, he developed his own artistic style and typography. He cuts, sculpts, and carves the posters. Inspired by the major trends of the 20th century, Thom Thom finds its roots in the New Realists or the Situationists. It is more than 15 years now hat he has worked in the streets cutting billboards. His technique depends on chance: his tool, the blade, places layer after layer over the posters to transform them into new pieces. With every stroke of blade, a new tile is placed on the original image, as if the artist knew what he would find under the pieces. All his work concentrates on the thickness of the posters. He is even more ephemeral than his counterparts of street art who are subject to constantly renewed advertising contracts. A genuine archaeologist of posters, Thom Thom has invented a new language. Nicknamed “The cutter artist”, Thom Thom founded with Jean Faucheur the association Le M.U.R. in 2003, which became one of the biggest references for street-art lovers in Paris. 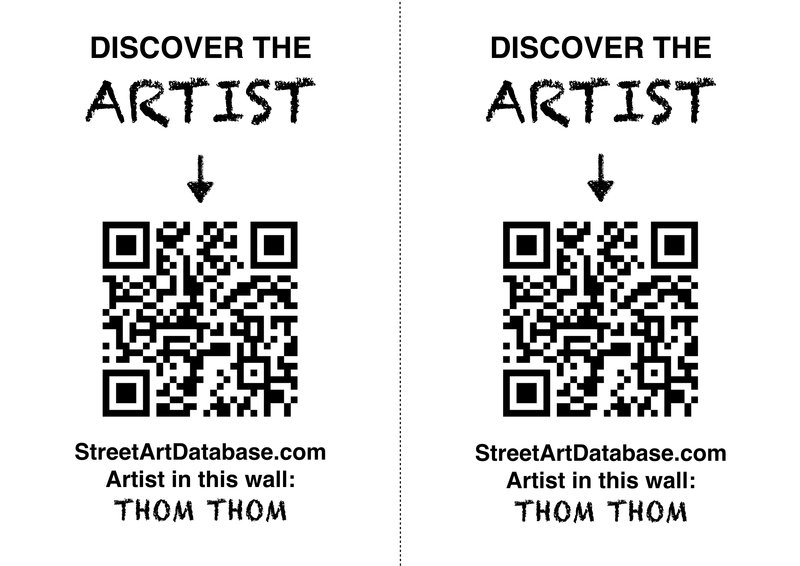 PRINT CODE: help tagging Thom Thom in the streets of your city! Posted in mosaic, street installationBookmark the permalink.